Reducing car use is one of the most effective ways to tackle congestion, and one way to do this is by using positive incentives to stimulate the use of other transport modes, such as cycling. A study carried out by the University of Twente in the Netherlands reveals more. The public-private partnership involved in the pan-European SOCRATES 2.0 (System of Coordinated Roadside and Automotive Services for Traffic Efficiency and Safety) project has developed a framework for the program’s joint vision, and Traffic Technology Today has an exclusive insight into the project’s aims and ambitions as it moves to develop a fully interactive traffic management system. EXCLUSIVE: How much do traffic managers need edge processing? As roadside hardware’s advanced processing capabilities reduce the need to send large amounts of data to the cloud, Dr Subramanian Ramamoorthy, associate professor at the School of Informatics, University of Edinburgh, discusses how this could change traffic management. 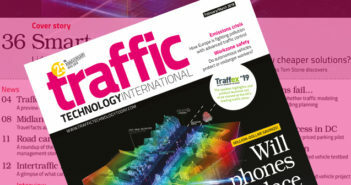 The Smart Transportation Market is set to grow from its current industry value of more than US$41bn to over US$130bn by 2024, according to a new research report by Global Market Insights, Inc.
TTT speaks to Esri’s global transportation industry manager, Terry Bills, to provide some additional insight into the potential uses of GIS.